Thanks to Create the Good for this guest post! “Life’s most persistent and urgent question is: ‘What are you doing for others?’” – Dr. Martin Luther King, Jr. Looking for ways that your family can celebrate the legacy of Dr. Martin Luther King, Jr.? Check out these meaningful activities and service ideas that honor the spirit of this civil rights hero who led millions in non-violent protests for racial equality. 1. Spend some time learning about Martin Luther King, Jr.’s work. Visit your local library and check out a good book! There are great reads for all ages, from preschool to adult-- about the life and teachings of Dr. King. Watch documentaries and footage of Dr. King’s speeches on your local PBS station, and give your children a better understanding of the significance of Dr. King’s words and actions. 2. Organize a community event. In honor of MLK, dream up a community impact event of your own and make it happen this year! You could host reading sessions at your local library, plan a community or playground cleanup, or enroll to coach a kids sports team. 3. Donate to a favorite family cause. The family that gives together learns a giving habit for life! Involve your kids in the decision-making process. Research online, talk about local charities your family cares about, or choose a project that speaks to you on a crowdfunding site like DonorsChoose.org or Indiegogo.com. Sites such as CharityNavigator.org can provide quick and reliable ratings and write-ups about charities that spark your interest. Talk with your kids about giving back and why it's important to actively support the people and causes they care about. 4. Collect and contribute. Cull gently-used clothes, coats, blankets, toys, books, and housewares and load up the whole family to take them a local non-profit such as a refugee support center or family services provider. Head to your local warehouse store and stock up on non-perishables and personal care products. Take the kids with you and then head straight to the food bank or homeless shelter to donate the goods. 5. Think ahead to other giving opportunities. Perhaps the schedule was too packed for your family to serve together on MLK Day this year, but community involvement and giving back are year-round efforts. 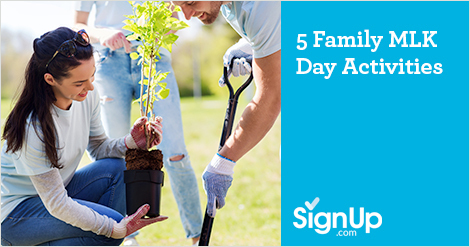 Take the time today to plan a service project with your kids for the coming months. Walk dogs for the local animal shelter, join a trail cleanup program, get involved with a community garden. An ongoing, regular commitment of service does more than honor Dr. King. It provides a model of community action that your kids will remember all of their lives!